Since 1994, leading companies across a variety of industries have trusted TeleContact Resource Services to handle their inbound customer contact needs. Our goal is to know your business inside and out in order to properly service clients, and effectively up-sell and cross-sell new business opportunities. From proven acquisition and retention programs, to innovative direct response solutions, our inbound call center services are customized to fit your unique business model. With proven experience across a wide array of industries, and a flexible business model, we offer best in-class solutions to companies regardless of the size and scope of the project. At TeleContact Resource Services, we pair industry leading technology platforms with extensive product and service related training to show our clients efficient call handling times without sacrificing quality of service. Let our expert staff show you a lower cost per call, efficient tiered support, and professional customer care. Rest easy knowing our skills based routing technology will ensure that every call gets matched to the appropriate customer service representative. We even offer live chat and email response programs for companies seeking a more robust inbound/outbound blended telemarketing campaign. Since 1994 leading companies across a variety of industries have trusted TeleContact Resource Services to handle their inbound customer contact needs. Our goal is to know your business inside and out in order to properly service clients, and effectively up-sell and cross-sell new business opportunities. From proven acquisition and retention programs, to innovative direct response solutions, our inbound call center services are customized to fit your unique business model. With proven experience across a wide array of industries, and a flexible business model, we offer best in-class solutions to companies regardless of the size and scope of the project. At TeleContact Resource Services we pair industry leading technology platforms with extensive product and service related training to show our clients efficient call handling times without sacrificing quality of service. Let our expert staff show you a lower cost per call, efficient tiered support, and professional customer care. Rest easy knowing our skills based routing technology will ensure that every call gets matched to the appropriate customer service representative. 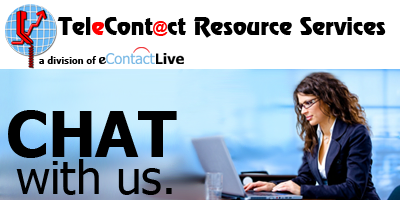 We even offer live chat and email response programs for companies seeking a more robust inbound marketing campaign. Since 1994, TeleContact Resource Services has evolved into a multi-channel marketing firm, not only providing outbound telemarketing services, but also a complete suite of inbound call center services.